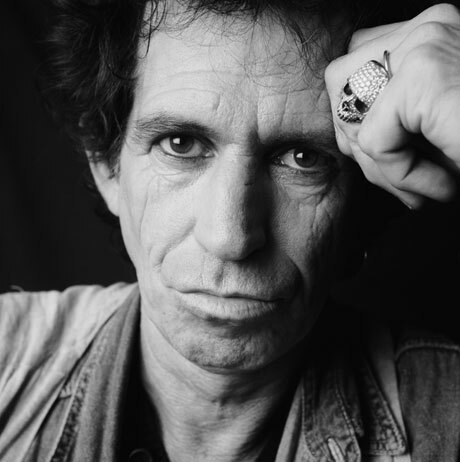 Keith Richards (born 18 December 1943) is an English musician, singer-songwriter and founder member of the English rock band the Rolling Stones. Rolling Stone magazine said Richards had created "rock's greatest single body of riffs", ranking him 4th on its list of 100 best guitarists. Fourteen songs Richards wrote with the Rolling Stones' lead vocalist Mick Jagger are listed among Rolling Stone magazine's "500 Greatest Songs of All Time". Harmony Meteor – This was Richards main guitar in the Stones' early periods it was all but retired in 1964 when he acquired his Les Paul Standard. 1959 Gibson Les Paul Standard – Richards acquired this instrument, fitted with a Bigsby tailpiece, in 1964. The guitar was the first "star-owned" Les Paul in Britain and served as one of Richards's main instruments through 1966. He later sold the guitar to future Rolling Stones bandmate Mick Taylor. The guitar was most likely stolen during the Nellcote burglary in July 1971. 1961 Epiphone Casino – Richards first used this instrument in May 1964, shortly before the Stones' first tour of America. The guitar (along with the 1959 Les Paul Standard) became a frequently used guitar by Richards until 1966. 1957 Gibson Les Paul Custom – In 1966 Richards acquired a 1957 Les Paul Custom, and hand-painted it with psychedelic patterns in 1968. It served as his main stage and studio guitar from 1966 through the end of the Rolling Stones' 1971 UK tour. The guitar was most likely stolen during the Nellcote burglary in July 1971, and ended up in the hands of a collector in the mid-1990s. A second late 1950s Gibson Les Paul Custom was acquired in 1969 to be used in open-G tuning on the 1969 and 1970 tour. Gibson ES-355s – Richards used this semi-hollow model on stage during the Rolling Stones' 1969 tour; it was a favourite for both Richards and Taylor during recording sessions for Sticky Fingers and Exile on Main St.. Richards has also used ES-355s on every tour since 1997. In 2006 he also unveiled a white Gibson ES-345. Gibson Les Paul Juniors – Richards has regularly used both single-cutaway and double-cutaway Juniors since 1973. The one he is most frequently seen with is a TV-yellow double-cutaway instrument nicknamed "Dice", which he has used since 1979. On recent tours he has used this guitar for "Midnight Rambler" and "Out of Control". 1953 Fender Telecaster – Richards acquired this butterscotch Telecaster in 1971. Nicknamed "Micawber", after a character in Charles Dickens's novel David Copperfield, it is set up for five-string open-G tuning (-GDGBD), and has only five bridge saddles. The neck pick-up has been replaced by a Gibson PAF humbucking pick-up, and the bridge pick-up has been replaced by a Fender lap steel pick-up (similar to a Fender Broadcaster pick-up). 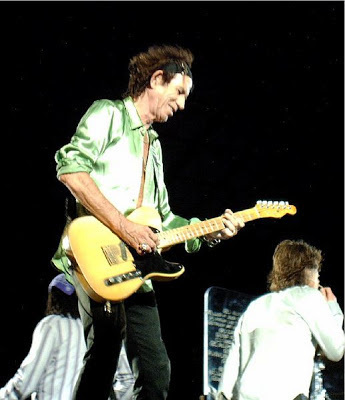 "Micawber" is one of Richards's main stage guitars, and is often used to play "Brown Sugar", "Before They Make Me Run", and "Honky Tonk Women". 1954 Fender Telecaster – A second Telecaster, nicknamed both "Malcolm" and "Number 2", is also set up for 5-string open-G tuning and has a Gibson PAF pick-up in the neck position. It has a natural finish and the wood grain is visible. 1967 Fender Telecaster – A third Telecaster used for five-string open-G playing is a dark sunburst model which is also fitted with a Gibson PAF pick-up; the PAF on this guitar has had its cover removed, exposing the bobbins. Richards has used this guitar on stage for many songs, including "You Can't Always Get What You Want" and "Tumbling Dice". 1958 Fender Stratocaster – Fellow Rolling Stones guitarist Ronnie Wood gave Richards his 1958 Mary Kaye Signature Stratocaster after the band's 1982 tour. The guitar is finished in see-through blond and fitted with gold hardware. Richards has used this guitar onstage for "You Don't Have to Mean It" and "Miss You". 1975 Fender Telecaster Custom – Richards first used this guitar on the Rolling Stones' 1975 Tour of the Americas, and it was his main stage and recording guitar until 1986. It was later adapted for five-string open-G tuning, and reappeared on stage in 2005. Ampeg Dan Armstrong plexiglas guitar – The Dan Armstrong guitar was given to Richards during rehearsals for the 1969 tour and became one of his main stage and studio guitars until it was stolen during the Nellcote burglary in July 1971. For the 1972 tour he purchased two new Dan Armstrongs which he only used during the first couple of shows. Fitted with a custom-made "sustained treble" humbucker pick-up, the guitar was used mainly in standard tuning and can be heard on "Carol", "Sympathy for the Devil" and "Midnight Rambler" on Get Yer Ya-Ya's Out. On the 1970 tour Richards added a second Dan Armstrong guitar fitted with a "rock treble" pick-up. Gibson L6-S Custom – Played around the time of "Black And Blue". Appears in a video performance of "Crazy Mama". Zemaitis Five-String – Custom-made in 1974 by British luthier Tony Zemaitis, the guitar nicknamed both "Macabre" and "the Pirate Zemaitis" was decorated with skulls, a pistol and a dagger. Richards used it as his main open-G guitar from 1975 to 1978, when it was destroyed in a fire at his rented Los Angeles home. Richards used a Japanese-made replica on the 2005–06 tour. Newman-Jones custom guitars – Texas luthier Ted Newman-Jones made several custom five-string instruments that Richards used on the 1973 tours of Australasia and Europe. Richards used another Newman-Jones custom model on the 1979 New Barbarians tour. This article is about acoustic guitar, the history of acoustic guitar, how it changed its looks, what was the first form of guitar etc. This article also has information on different kinds of guitars and how they look like.